Sen. Thom Tillis made the comment on the "Powerhouse Politics" podcast. Sen. Thom Tillis had high praise for President Donald Trump's leadership during a bipartisan immigration reform meeting at the White House Tuesday, commending his willingness to be flexible on key issues in the negotiation and for allowing the press to observe the proceedings for nearly an hour -- a grant of access unprecedented under the Trump administration. "There was genius displayed yesterday in the meeting. It's sort of a rare genius up here -- it was actually listening and being flexible," said Tillis, R-N.C., in an interview on the "Powerhouse Politics" podcast with ABC News' Chief White House Correspondent Jonathan Karl and Political Director Rick Klein. Tuesday's summit included spirited debate between Democratic senators advocating for protections for so-called "Dreamers" -- the young, undocumented immigrants previously protected by the Obama administration's Deferred Action for Childhood Arrivals (DACA) policy -- and Republican legislators who largely want to pair new immigration laws with guarantees for increased border security, potentially including funding for Trump's controversial border wall proposal. While Trump has been steadfast since the early days of his presidential campaign about his desire for a wall, Tillis said that at the White House Tuesday, Trump told him he would abide by whatever deal the senators could strike among themselves. "Probably the most compelling statement that he made to me yesterday was, 'I will honor what you all decide you can agree on. I will accept something and sign in to law something that's short of what I would prefer, in the interest of solving the problem,'" the senator relayed. Yet in a news conference at the White House Wednesday afternoon, Trump made clear that he won’t defer to Congress on all matters when he was asked about the possibility of being presented with a bill that does not include funding for a border wall. "No. No," the president said. "It's got to include the wall. We need the wall for security. We need the wall for safety. We need the wall for stopping the drugs from pouring in... Any solution has to include the wall, because without the wall it all doesn't work." Describing himself as "a silver lining kind of guy," Tillis named a number of positive developments from the discussions, among them, Trump "saying it's not going to be a monolithic wall from the Pacific Ocean to the Gulf of Mexico" and "showing that he's willing to accept something maybe less than what he started out with." He further praised the decision to allow reporters to document the conversation for 55 full minutes. (J. Scott Applewhite/AP) Sen. Thom Tillis, R-N.C., is surrounded by reporters as he makes his way to a closed-door GOP policy luncheon, at the Capitol, Jan. 4, 2018. "I thought it was a great idea," Tillis said, adding, "One thing that was funny, I think it was about 30 minutes into it, I looked up at all the journalists and they're all looking around like, 'Do they know we're still in here?'" The North Carolina Republican, who introduced legislation in September to prevent a president from removing a special counsel, additionally commented on the status of Robert Mueller's Russia investigation, which Trump again called a "witch hunt" in a tweet Wednesday morning. Tillis said he thinks that he and his colleagues should "step back, let the investigations play out and let them be as broad or as narrow as the special counsel and the Department of Justice think they need to be." His proposal, he said, was not a indictment of the actions of Trump or Mueller in this specific instance, but a protectionary measure he hopes could have an "enduring impact for future administrations" as well. 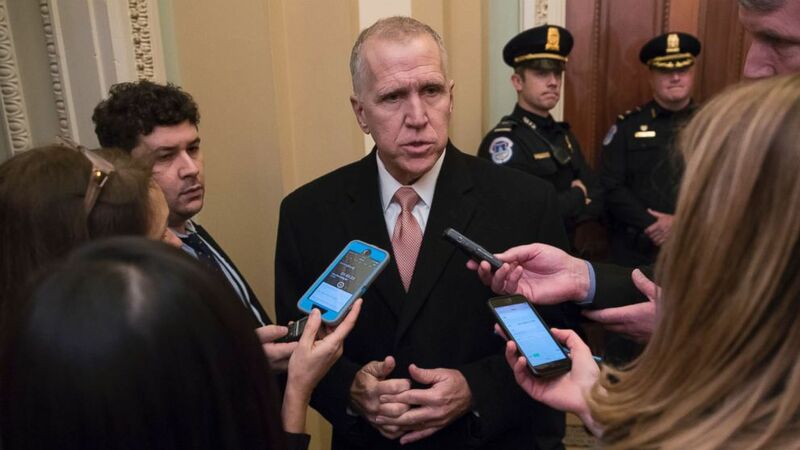 "I think it has less to do with influencing this investigation and more to do with the Senate and the Congress asserting some influence over the handling of the special counsel, which obviously was created under Congressional action," Tillis said. The senator did have a suggestion for a separate inquiry however, one related to The Washington Post's December decision to list the fried chicken chain Bojangles -- which was founded in the Tar Heel State -- second-to-last in a ranking of fast food biscuits. A tweet from Tillis lambasting the newspaper's verdict went viral at the time. "I think it was an egregious decision," he said Wednesday. "That alone may be subject to a special investigation."